I love sharing research that examines how writing your story can be beneficial to your health (or not). 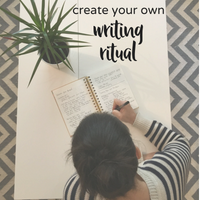 This week I'm sharing an article that looks at how writing affects your physical health. Journal Article: Bourassa et al. Impact of Narrative Expressive Writing on Heart Rate, Heart Rate Variability, and Blood Pressure After Marital Separation. Psychosom Med. 2017 Jul/Aug;79(6):697-705. Finding: People in the Narrative Expressive Writing group had lower heart rate and higher heart rate variability than people in the two other groups. Both of these are good things for your overall health. Blood pressure was not different among the groups. Takeaway: Writing your story after separation might help improve your physical health. Commentary: The study I shared last week found that writing your story could be bad for your emotional well-being in some cases. Well, some of those same people were found to have improvements in their physical health after writing their story. It's a little confusing. Should I write because I want to be healthy in my body or should I stay away from writing because it might be unhealthy for my mind? My take: If you are someone who is deep in a well of trying to find meaning from your separation, it might behoove you to hold off on writing. Otherwise, try it and see how it feels for you.